Today is cloudy but the sun is trying to peek through.. FINALLY! Does anyone know how low the temperature actually was? It sure has been feeling cold! BRRR! Today has been a gray cool day. The seas are very rough. Now we are experiecing strong gusty winds as a rain squall moves in. I just checked the sat pic and the convection in the Northeastern Caribbean has increased compared to the morning hours. St. Maarten is experiencing the fringes of Tropical Storm Jerry at the moment; rough seas, strong gusty winds, and scattered showers. GREAT BAY, St. Maarten (GIS) - The Spanish Newspaper "El Hispano," the TV Program Informativo 7, and the Radio Program "Fiesta Caribe," are partaking in the dissemination of hurricane awareness information being provided by the Department of Emergency Disaster Management Services (HVD) under the coordination of the Government Information Service (GIS). El Hispano Director Maximo Castro, told the GIS that he would fully cooperate by publishing hurricane awareness information in the Spanish language weekly in order to reach the islands Spanish community. Informativo 7 is hosted by Spanish TV personality Renaldo Urena on the regular Channel 7 and on Channel 45 via the Cable TV network. Fiesta Caribe is hosted by Ricardo Goitia. Fire Commander Winston Salomon who is also head of HVD, told the GIS that providing basic information to the different ethnic groups on the island that make up the nation of St. Maarten, is essential if everyone is to be reached adequately. The Island Governments Hurricane Awareness Campaign with the theme, Hurricane Season 2001 - Be Prepared, Facing the Threat Together," started during the third week of July and profiled the majority of the Emergency Support Functions (ESF) that make up the disaster management system. Basic hurricane awareness information along with emergency shelter locations was also provided to the general public utilizing a number of popular radio programs to disseminate the information throughout the community. El Hispano was established in 1997 and is distributed at several locations throughout the Dutch and French sides of the island. Everything is back to normal on the "Friendly Island." Weather conditions started to return to normal as of early Thursday afternoon. On Thursday morning the Chairman of the Emergency Operations Center (EOC) Lt. Governor Franklyn Richards, called a mini-EOC meeting to get an assessment of the situation on the island due to the heavy rain fall. Presentations were made by Sector Welfare, the Emergency Disaster Management Dept, the Weather Service and the Police. Schools were advised to close earlier than scheduled, while the channel leading from the Fresh Water Pond to the sea at the Great Bay Hotel was opened to allow access water to flow into the sea. Pumps were also put into motion to pump water from the Salt Pond via a channel into the sea while the flood gates regulated the water level between the Fresh Water Pond and the Salt Pond. The EOC team also utilised the Emergency Alert System for the first time. This allows the Chairman of the EOC to break into regular radio broadcasts in order to inform the public about an emergency situation. One remembrance of the Tropical Wave which later became Tropical Storm Dean which was well away from St. Maarten when it was formed, was a blue cargo vessel moored in Simpson Bay that broke its moorings and ended up on the beach near the runway. 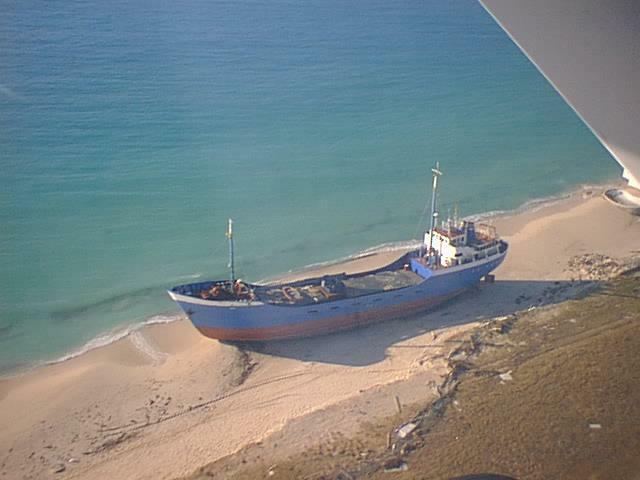 This same vessel was washed ashore in 1999 by Hurricane Lenny and removed several months ago, but now ended up in the same spot on Wednesday. Police and Youth Health Care Being Featured in HVD Hurricane Awareness Campaign "Be Prepared, Facing the Threat Together"
GREAT BAY, St. Maarten (GIS) - Chief Commissioner of Police Derrick Holiday, head of the Emergency Support Function (ESF 5), will provide information on Thursday via Lloyd Richardson's Viewpoint Radio Program. Chief Commissioner Holiday will discuss the Police Organizations role in relation to the disaster management structure that has been established. The law enforcement body is known as ESF 5 and is part of the 10 ESF disaster management units that has been established to deal with any type of disaster that the island should experience. The Police Commissioner will also shed some light on the preparations that the Police Force has taken in relation to the 2001 Hurricane Season. A representative from Sector Health Care Affairs ESF 6 department Youth Health Care, will be participating in the Radio Program Woman's World hosted by Ramona McDonald, PJD-3 on Friday. Fire Commander Winston Salomon who is also head of the Department of Emergency Disaster Management Services (HVD), told the Government Information Service (GIS) that the Hurricane Awareness Campaign with the theme, Hurricane Season 2001 - Be Prepared, Facing the Threat Together," will be tapering off after six weeks of providing the public with information. Salomon told GIS that he is very thankful to the media who have played a very important role, especially the various talk-show program hosts who cooperated by allowing various government officials and others to inform the public about the disaster management structure that is in place via their programs on a weekly basis. Next week will be the final week of the six-week hurricane awareness campaign. The HVD campaign will thereafter work with the Spanish and Haitian communities in relation to the dissemination of basic hurricane information and publicizing the locations of the hurricane emergency shelters. Viewpoint can be heard on Thursday from 12 noon to 1pm on Radio PJD-2. On Friday, the PJD-3 radio program Woman's World can be heard from 5pm to 6pm. The Tropical Wave passing through our area has caused some disruptions. Parents have been told by the authorities to pick up their kids from school; flooding has taken place in some low lying areas; the seas are very rough along the South coast of the island; it has been raining constantly since 7am. The Wave caught everyone by surprise when the awoke this morning. From Tuesday late afternoon, the Wave rain bands started to pass over, and we also experienced some intermittant showers. Shower activity with gusty winds started at around 5am, with rain activity increasing from 7am. The Chairman of the Emergency Operations Center (EOC) Lt. Governor Franklyn Richards held a mini-EOC meeting on Thursday to receive appraisals about the island territory's state of preparedness due to at that time TS Chantal (now is a tropical wave). The Chairman received an update from the Emergency Management Services, Public Works Dept., the Weather Service, and Law Enforcement. Since early Friday morning we have been experiencing short bursts of gusty winds from the remnants of TS Chantal now a tropical wave. Based on sat. pics, the wave is very large and the northern fringes are being experienced here in the North Eastern Caribbean. We have also had some scattered showers of rain. told the Government Information Service (GIS), that radio station owners on the island were recently presented with an Audio Frequency Shift Keying (AFSK) system. This would allow HVD Emergency Alert System (EAS) via radio frequency 107.9 FM, to send an information bearing signal to broadcast stations main audio channels. The audio channel received by the local radio stations will be of broadcast quality. Chairman of the Emergency Operations Center (EOC) Lt. Governor Franklyn Richards, is very pleased with the progress that has been made in relation to the upgrading of the disaster management infrastructure on the island. Richards, once again is appealing to the general public to make sure that they have everything in place in the event of a hurricane threat. This appeal is being made as the island approaches the peak weeks of the 2001 hurricane season. The EOC Chairman says that by every citizen taking the necessary preparations in being prepared, the loss of life would be minimized or avoided, and the damage to property limited. The EAS is basically a new and improved Emergency Broadcast System (EBS). These were devised to provide a means to communicate with the public in the event of a national emergency. The main difference between the new EAS and the older trunk radio based EBS system, is in the method employed to alert equipment at radio stations about an incoming message. Currently the EAS system is only applicable to radio stations, however, the HVD plans to work on integrating EAS technology into cable TV broadcasts as well. With the aforementioned system, official information pertaining to any disaster that the public needs to be aware of, can be simultaneously transmitted and rebroadcast on all local stations. The system is designed primarily as a public information and warning system in the event of Hurricanes, but can be used for other disaster applications as well. The HVD is preparing public awareness programs, preparedness tips and general safety information clips which will be played on the system at pre-programmed times. In the meantime the HVD Hurricane Awareness Campaign with the theme, Hurricane Season 2001 - Be Prepared, Facing the Threat Together," continues this week by highlighting the Emergency Support Functions (ESF) that makes up the disaster management system. On Wednesday August 15 from 12 noon to 1pm on PJD-2 Radio program Viewpoint hosted by Radio personality Lloyd Richardson, ESF 6 Sector Health Care Affairs (SHCA) will be highlighted; on Thursday August 16 after the 1pm news on Soualiga Broadcasting Services hosted by its Director Eddy Williams, hurricane related information will be provided; and on Friday August 17, the PJD-3 radio program Woman's World hosted by Ramona McDonald, will provide hurricane related information will be provided by SHCA. Left to right: HVD Official Paul Martens, Fire Commander Winston Salomon, Consultant to HVD John Dovale, Fire Dept. Technical Officer Marco London, and representatives of Radio Station PJD-2/3, Laser 101, and Soualiga Broadcasting Services. - "Be Prepared, Facing the Threat Together"
Salomon & Heyliger Pleased with Hurricane Awareness Campaign "Be Prepared, Facing the Threat Together"
GREAT BAY, St. Maarten (GIS) - Fire Commander Winston Salomon who is also head of the Department of Emergency Services (HVD), is very pleased with the way the HVD Hurricane Awareness Campaign with the theme, Hurricane Season 2001 - Be Prepared, Facing the Threat Together," has been going since it was kicked off on July 24. "The media has been very cooperative in relation to the dissemination of information to the public at large in relation to hurricane awareness. "Our objective has been to inform the members of our communities about the disaster management structure that we have in place comprising of 10 Emergency Support Functions (ESF). Secondly, we have also been coordinating the dissemination of basic hurricane preparedness information and re-enforcing the message of being prepared," Salomon said. Commissioner responsible for HVD Theo Heyliger, told the Government Information Service (GIS), that the dissemination of information to the public about the disaster management system that has been developed over the years based on various experiences with hurricanes, would give the public a sense of relief that a good system is in place to handle any eventualities that would develop during the passing of a hurricane. The other important ingredient according to Commissioner Heyliger, is reminding the general public about what measures should be taken, and the re-enforcement of that message in order for everyone to be prepared. "We are all in this together, and as our theme says, Be Prepared, Facing the Threat Together. An informed pubic is once that is prepared and is able to recover quickly and help our national economy bounce back as soon as possible," Heyliger said. On Friday, the PJD-3 radio program Woman's World hosted by Ramona McDonald, will highlight the non-governmental organization, the Red Cross. Red Cross representatives will be Commander Joseph Charles, Assistant Commander & Field Coordinator Julia Boasman, and Assistant Commander Warehouse Coordinator Sylvio Pantophlet. The role of the Red Cross in disaster preparedness; types of assistance that could be rendered to families; and some specifics on pet animals, persons with allergies, and asthma sufferers, will be highlighted in the radio program to be aired from 5pm to 6pm. Meteorologist Ashford James will be the guest on the Marine Magazine scheduled for Sunday on PJD-2/3 Radio AM/FM, from 9am to 10am. The host of the program is Ramona McDonald. James will discuss the predictions of intense hurricane activity that has been predicted for the next 30-40 years. He will also discuss Professor William Gray's updated August 7 forecast of Atlantic Seasonal Hurricane Activity. Next week the hurricane awareness campaign coordinated by HVD and the Government Information Service, will feature ESF 10 Sector Economy & Tourism, ESF 6 Sector Health Care Affairs, in cooperation with the Radio program Viewpoint hosted by radio personality Lloyd Richardson and a program on Soualiga Broadcasting Services hosted by its Director Eddy Williams. Today Sunday, was a cloudy and rainy day with gusty winds and rough seas from a passing tropical wave. However, mostly everyone still went about their daily activities, even to the beach, wind surfing, kite flying, jet-sking, sailing etc. GREAT BAY, St. Maarten (GIS) - Chairman of the Emergency Operations Center (EOC) Lt. Governor Franklyn Richards, is calling on the community to be prepared as the hurricane season moves into the active months of August and September, which is less than two weeks away. Richards told the Government Information Service (GIS) before leaving for Holland, that at this stage of the hurricane season, all preparations in the event of a hurricane strike should already be in place by residents and the business community. "Everyone has had ample time to take various actions required to protect their homes and businesses. We have all gone through the experiences hurricane season after hurricane season to know what preparations and precautions have to be taken in order to protect human life," Richards told GIS. The Department of Emergency Services (HVD) is presently monitoring the weather situation on a daily basis in the Eastern Atlantic and Caribbean Sea area. Operational procedures are in place in relation to what actions and measures would be taken when the core EOC operational command has a meeting to assess the threat of an impending storm situation. "In the first meeting of the Emergency Support Functions (ESF), we would assertain the general state of readiness of each of the core groups. A number of things would be looked at such as current water storage capacity; GEBE Utility Company recovery period if minimal damage is sustained; current status of the water level in the Great Salt Pond, and the status of pumps. "The status of shelters, the medical center, the current readiness of the Police, Voluntary Corps of St. Maarten, in relation to the implementation of traffic and curfew controls. These are some of things that would be discussed in our meeting if there is a threat to our island by a hurricane," EOC Chairman Richards told GIS. HVD has been very busy during the past months coordinating the preparations for the 2001 Hurricane Season. A number of meetings have been held between the various core ESF, private sector organizations and entities in preparation for the season. A three-week hurricane awareness campaign is to get underway shortly as well as general island-clean-up, Operation District Clean Sweep 2001, is planned for August in relation to all debris and non-household garbage being collected and disposed of; The Emergency Radio Broadcast system which can be found on 107.9 FM is also operational, but in the testing phase, and in September, legislation in relation to disaster management will also be ready. Lt. Governor Richards is advising residents to execute the following measures if they haven't done so already: An evaluation of your home (roof structure, hurricane shutters); check for loose gutters; trim tree branches and clean-up outside your homes and business places from possible flying debris that could become missiles damaging other buildings in your area; prepare a hurricane kit comprising of a portable radio, batteries, flashlights, medicines, first aid kit, water, and non-perishable foods. These are some of the measures that should be taken at the beginning of every hurricane season. If the aforementioned have not taken place, it is advisable that this be done as soon as possible. GREAT BAY, St. Maarten (GIS) - Operation Hurex (Hurricane Exercise) involving approximately 100 emergency, disaster management personnel and marines, will get underway next week Monday on St. Maarten, according to Commander of the St. Maarten Fire Department/Coordinator of the Department of Emergency Services (HVD). This is in preparation for the 2001 Hurricane Season. Salomon explained that this operation is needed to make sure that from an operational approach in a disaster situation, all agencies involved know exactly what their roles and tasks are in order for things to run in an efficient manner. The practical part of Operation Hurex will be conducted on Wednesday June 13 and will take place in the non-residential areas of Cay Bay and Mullet Bay. This type of operation is carried out at the beginning of every hurricane season bringing together the Royal Dutch Marines, Police, Fire Department, Voluntary Corps of St. Maarten and several other agencies. Salomon, they need to be aware of the environment that they may be called up to provide assistance. A group of 43 marines will arrive on the island Monday June 11 for the one-week operation in the Dutch Windward Islands. Those involved in the exercise on St. Maarten will be based at the Raoul Illidge Sports Complex. The Marines will also familiarize themselves with the disaster management system and the people involved, and also visit and get acquainted with the locations of the Hurricane Shelters. The Fire Department personnel will demonstrate the use of certain disaster equipment and fire fighting techniques, as this is part of the ongoing training cooperation between the Fire Department and the Royal Dutch Navy. The Royal Dutch Marines will also carry out operations on Saba and St. Eustatius. Seven marines will go to each of the two islands while 29 will be on St. Maarten. GREAT BAY, St. Maarten (GIS) - The message coming from Fire Commander Winston Salomon for the 2001 Hurricane Season that officially opens June 1 is "to be prepared." Salomon is urging all residents to review their situation at home and to check their hurricane emergency kit at the beginning of the season to see that everything that would be needed in the event of a hurricane threat is already in place. The business community including hotel properties should also review their pre-hurricane strike plans and take all necessary measures that need to be taken now so that each and everyone can be ready in the event of a possible hurricane threat. Salomon told the Government Information Service (GIS) on Thursday, that the Department of Emergency Services (HVD) has been very busy during the past months putting various things in place in relation to disaster preparedness and management. very beginning of the season. Whatever needs to be done around the home or place of business should be done as soon as possible," Salomon points out. Experts forecast a normal season, however, warn that on average one major hurricane makes landfall somewhere in the Caribbean during a normal season. "A normal season doesn't mean that we have to let our guard down. Last year we were very lucky and were spared the wrath of a serious hurricane. The forecasts for 2001 should not leave the nation becoming complacent this season," Salomon said on Thursday. Commissioner responsible for the Fire Department/HVD Theo Heyliger, told the GIS that he fully agrees with Salomon's comments, and adds, "An ounce of preparation is better than a pound of cure." The HVD in conjunction with the GIS will be implementing an awareness campaign throughout the six-month hurricane season. The mobility pass system that started March 15 and concluded May 1, led to 660 passes being applied for by the private sector. This is also one of the projects in preparation for the 2001 season. A meeting has already been held with the Red Cross, Sector Social Welfare, and Sector Environmental Development & Property Management concerning the hurricane shelter management program. A number of government bodies have also submitted their hurricane plan of action programs that will be included in the National Hurricane Plan. Semi-private entities such as the utility company GEBE have also submitted a plan of action to HVD. In the coming weeks a number of meetings will be held between HVD officials and private organizations such as the Sea Rescue Foundation and others concerning preparations for the 2001 season. Salomon states that his department is looking forward to working with the non-governmental organizations on this front. The United States National Oceanic and Atmospheric Administration (NOAA), is predicting between eight and 11 storms, of which five to seven will develop into hurricanes, with two becoming major hurricanes with wind speeds of 111+ miles per hour.